See. Hear. Experience. Join the just-opened National Law Enforcement Museum, the first of its kind located right here in DC's Judiciary Square, just blocks from the National Mall. Find out how to make split-second, life-altering decisions in the Cop Training Simulator (ages 12+), take emergency calls as a 911 dispatcher, and learn what it's like to lead a double life as an undercover agent. Experience law enforcement in a way you won’t find anywhere else! 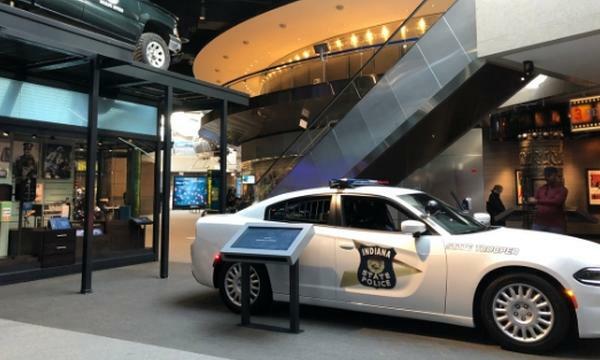 The NLEM gives its visitors a “walk in the shoes” encounter where you'll go behind the badge to learn what it’s like to be a modern day law enforcement officer in the U.S. through memorable, immersive exhibits, artifacts and programs. Using a collection of more than 20,000 objects to tell the story of American law enforcement – past, present, and future – the NLEM engages visitors of ALL ages as it seeks to strengthen the relationship between officers and the communities they serve. Enjoy pop culture memorabilia from your favorite "cop" TV shows, delve into the messy and meticulous world of forensics and test your Law & Order skills with a role-play in their interrogation room. This educational museum offers families an excellent opportunity to learn all of the many notable careers in law enforcement. Check out the catchy video below where law enforcement officials invite you to "ride along" with them in this new must-do museum experience (karaoke-style). $11 for One Child Admission to the National Law Enforcement Museum ($14.95 Value - 27% Off). $16 for One Adult Admission to the National Law Enforcement Museum ($21.95 Value - 28% Off). Unless otherwise noted on their website, the museum is open everyday from 10 a.m. - 6 p.m. (last entry at 5 p.m.) The museum stays open until 9 p.m. on Thursdays. Click HERE for more information. Please note there is an additional charge for some Museum exhibits and features. Due to some violent content in the Training Simulator, it is only available to those age 12+. Questions? Need More Information? Please contact The National Law Enforcement Museum at 202-737-3400 or email [email protected]. Multiple vouchers may be purchased and redeemed. Cannot be combined with any other special offers, promotions or discounts. Not valid on prior purchases. Vendor is responsible for the quality of the products or services provided at redemption. Operating hours are subject to change; check directly with vendor prior to visit. Merchant cancellation policy applies.